Here's a vintage Christmas pro-tip: Head to your local Goodwill about two weeks after Thanksgiving and you'll come across an abundance of Christmas decorations that people have discarded. It works something like this: Friday after Thanksgiving, people decorate their houses. By Saturday or Sunday, the 'remnants' (as I call them) are still sitting in the tubs and people have decided that certain things didn't make the cut. That can be ornaments. Or figures. Or garland. Or lights. Or...on occasion, Marshall Field's Walnut Room Christmas mugs. I've written about these mugs before on the blog. Here's the 1980 mug. And the 1981 mug. 1980 featured a bear. 1981 featured contortionist Santas. Here's the 1983 mug that featured Uncle Mistletoe. I've talked at length about how I get all fired up every time the topic of Uncle Mistletoe comes up and how he's been back-benched over the years. I blame this Santa bear. And this mug from 2000? The marriage? It is a cute mug, but I still think the Santa Bear years are dark years for Marshall Fields. We have mugs in our collection that cover the past few years, but I haven't posted them yet. I need to get around to that, so I can have the authoritative collection of Walnut Room mugs over the years. A guy can dream, right?!?! This mug - the 2000 version - went to my sister Vic as a gift as she's collecting them from over the years. Here's the rundown of the mugs that I've covered over the years. 1980 - Tree with Bear tall glass. 1981 - Contortionist Santas glass mug. 1983 - Uncle Mistletoe tall glass. 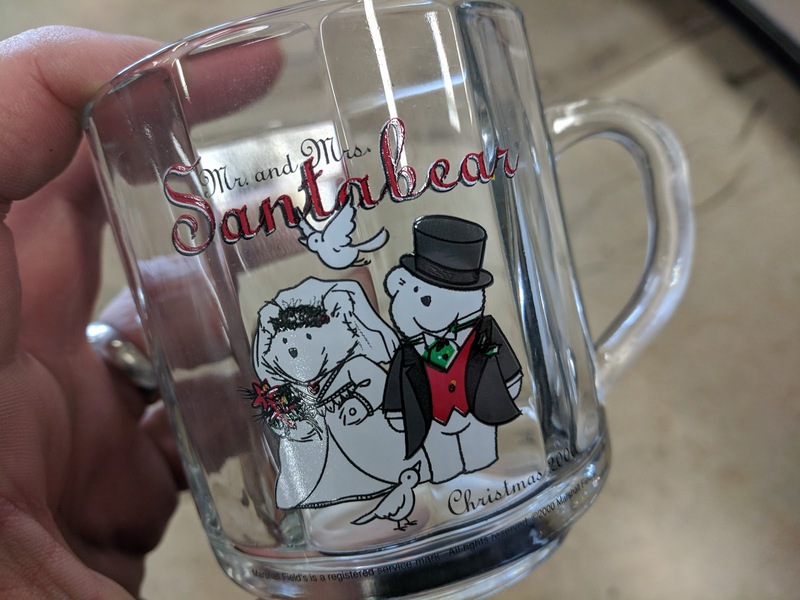 2000 - Mr. and Mrs. Santabear Marriage glass mug with multiple colors.